Identifying your goals is the first step in your blueprint for Success. The process of setting goals helps you mindfully choose where you want to go in life, keeps you mindfully aware of opportunitites and keeps you open to your intuition and inspiration. Some people seem to attract success, power, accomplishments and wealth with what appears to be very little effort; others conquer their life with great difficulty; still others appear to fail altogether to reach their ambitions, desires and ideals. One of the big reasons could be that successful people set goals and intentions for achieving what they desire in life. Let's start with one goal. 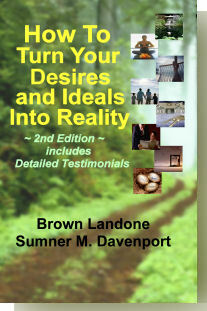 After you have completed the exercise on one goal, you can use the same strategy on all your other desires and goals. To being with - think - what is your most important goal? Important to you - not anyone else. Decide exactly what you want. Instead of fuzzy goals like I want more money, or I want better health or I just want to be happy; be specific about exactly how much money, exactly what level of health and fitness you desire. For happiness, you will find that moving towards your most important goal and then achieving it, will add to your happiness without any other effort. A mst important next step is to write out your goal. Many people don't write out their goals, and they then complain that goals don't work. Most people spend more time making a list of groceries before they go shopping or planning a party than they do in planning their lives. So, if that's you - this time,- write out your goals. If you cannot write out your goal clearly and specifically, then it means that you are not really clear about it yourself. Perhaps you don't even want it. What is worse, it may be that you are afraid that you may not attain it. Nonetheless, a goal that is not written out is merely a fantasy or a wish. A goal that is clearly written and described takes on a power of its own, it is now something concrete that you can touch and feel and work with. Years ago, Napolean Hill wrote in his best selling book: Think and Grow Rich , that "thoughts are things only when the fire of passion is fueling them. Passion can be positive in desiring something, or negative in worry, frustration and counter productivve thinking. You will make your journey easier or more difficult for yourself with your attitude, thoughts and actions. Start by thinking of what your goal and let yourself FEEL the joy of having that goal. You can choose to either feel the joy of achieving your goal, or the pain of stress as you worry about not reaching your goal. The fear of failure can work on you unconsciously. Which do you choose? Create your "big picture" of your goal. Every worthwhile goal has multiple steps to getting there. Once you envision the bigget picture (result) of your goal then break it down into the smaller and smaller targets that you must hit in order to reach your goal. don't attempt to plan everything out at this point. Many things will happen, and many opportunties will present themselves as you move towards your goal. So write what you know and stay open for guidance and new opportunities along the way. I find it's useful to put my goal into a three ring binder, or a special folder on my computer. As I go through my day, inspiration may pop in so I add that information to a blank page in the binder, or a notes document in the folder in the computer. When this new informaiton is clear and applicable to one of the steps to reach the goal, it's put in the corresponding space. For instance, if my goal is to sell a certain amount of product, and I'm building a contact list, and then I meet someone who can get me an introduction to my targeted prospect; that information may be entered in the section of my prospects. Having this introduction may upgrade my contact list actions. If my goals is to drop excess weight and gain a certain clothing size, one of the steps to that goal may be to get more exercise. If I am introduced to a charity who is using a marathon as a fundriasing event, that information may go in the section on creative ways to accomplish my goal. The more information I gather, the more solutions I have to choose from.